There’s no such thing as bad pizza — but what separates the okay pizza from the amazing pizza? Quality. At Ultimate California Pizza, we handcraft every pizza with high quality ingredients to make sure each slice is packed with flavor. There’s a reason we’ve been voted ‘Best of the Beach Pizza’ year after year. We don’t cut corners when it comes to making pizza — we just cut slices. Each tasty pie is made from scratch every day with our secret recipe for dough. While fresh toppings usually get all the glory, never underestimate the power of a high quality crust. Give your pizza the tasty base it needs with one of our crust options: hand tossed Italian white, rosemary whole wheat, and even gluten free! Not only do we have a secret recipe for our dough, but our sauce as well! Nothing packs a punch of flavor quite like a well-made pizza sauce. We believe in using high quality ingredients, which is why you’ll never catch us using a sauce from a can. To make sure we are sourcing only the freshest and top ingredients for our pizzas, we have our own farm out in California to grow our tomatoes. This special farm is home to all the savory tomatoes that go into the sauce you know and love. Sauce is the foundation of building a great pizza, especially when you have so many tasty options. Don’t be afraid to slather on one our of flavorful sauces — you can pick between our Ultimate Red Sauce, Roasted Garlic, Cattlemen’s BBQ, Ranch Dressing, Herbed EVOO, Sweet Thai Chile, Alfredo, Mango Habañero, Pesto, Salsa, or Hummus sauce. Once you’ve picked out the base for your gourmet pizza, it’s time to load up on the best part: cheese and toppings! We only use the freshest ingredients in our pizzas, all the way from the dough to the pepperonis. Whether you’re looking to satisfy your craving for meat or add something green to your pizza, we’ve got anything you could ever want to choose from! If you’re feeling bold, branch out from our usual tasty mozzarella and sprinkle one of our other cheeses on your pizza. You can choose between cheddar, smoked gouda, monterey jack, chevre, swiss, parmesan, crumbled bleu, feta, and provolone. If you stand by the classic mozzarella, we have fresh mozzarella and even vegan mozzarella to top your pizza with! All of our Best of the Beach pizzas are made to order, so don’t hold back when it comes to toppings! You can keep it simple with the traditional pepperoni or branch out and add on some of our bolder topping options, such as tofu, pesto chicken, meatballs, pineapple, coconut, and more! No matter what you’re in the mood for, we’ve got tons of options to select from. After you’ve loaded up your pizza with our tasty toppings, finish it off with one of our herbs. You can give your pizza that last little pop of flavor it needs with Cajun Seasoning, Oregano, Dried Basil, Rosemary, or our UCP All Purpose herbs. For those of you dining with a picky-eater, you don’t have to hold back! You can both satisfy your taste buds with a half-and-half pizza. 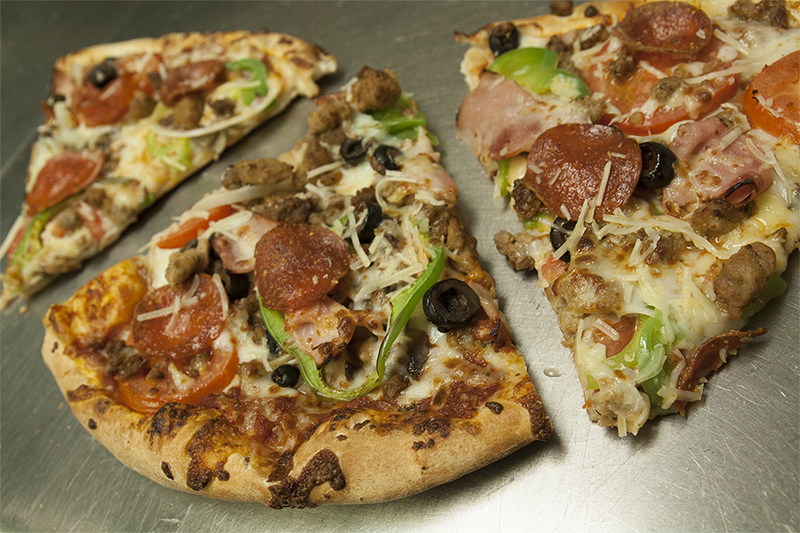 Load up one side with every topping on the menu while filling the other side with some of our more traditional options. No one has to compromise on what they want with a half-and-half pizza. No matter how tame or wild your pizza preferences are, you’ll be able to pick out exactly what you want. With all these options, it’s hard to pick out what’s going to go on your perfect pizza. But once you’re ready to order, we’ve made it even easier for you to enjoy our tasty pizza. We’d love for you to dine in and join us for dinner at one of our Myrtle Beach locations, but if you’ve got a busy night ahead of you, we’ve got you covered. Place an order for pick-up over the phone or online and stop by on your way home from work and we’ll have your dream pizza waiting for you. Or, make it even easier on yourself and give us a call for delivery and we’ll deliver a hot and fresh pizza right to your door! Our pizzas are made from fresh, quality ingredients and are filled with flavor from start to finish. We believe by putting in the extra time and effort into handcrafting these doughy work of arts that we’re able to consistently produce the best quality pizza every time you dine with us.